back at home to follow along with me on my journey in "semi-real-time." I performed this feat by using a mixture of ultra-modern and somewhat archaic technology, at a somewhat greater expense than I had anticipated, and with gritty determination (and more than a little dumb luck). Since many people have asked me how I captured, processed, and transmitted these images, I thought I'd document it here to inspire (alarm?) those of you who may be planning to attempt a similar project. Camera: I'm not a photographer, so I wanted a camera that was easy to use. And I wanted a digital camera so that I could transmit my photos back to my website each day. 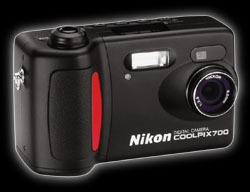 After conducting a fair amount of research on the Web, I decided to get the Nikon CoolPix 700, a 2-MegaPixel camera capable of taking photos with a resolution of 1600x1200. This is much higher than the resolution of photos that are typically displayed on the Web, so I figured that I was erring on the side of safety by capturing a greater level of detail than I'd be able to display. The CoolPix 700 takes photos at several different resolutions and quality levels, and I found that I was able to switch back and forth between them with just a little practice. I was quite pleased with the quality of the resulting photos, especially since the persistent cloud cover made for abominable lighting conditions. Camera model numbers change constantly, and I suspect that the CoolPix 700 is no longer in production. But Nikon has surely produced successors that are higher in quality  and, quite possibly, lower in price than the $600 I paid for mine back in August of 1999. 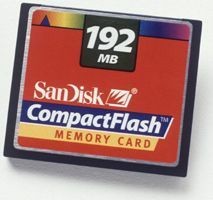 PCMCIA CF Card Adapter: Even with all that extra memory, I still wanted to be able to transfer the photos to my laptop PC regularly. (For one thing, I planned to take more photos than could be stored in even the extra memory; for another thing, I didn't want to have only one copy of the photos in case the cards were lost or damaged; and finally, I needed to have the photos on my computer so I could transmit them to my webserver.) The CoolPix 700 came with a serial cable that allowed me to transfer photos directly from the camera to a PC, but that technique was painfully slow. The problem was solved with a SanDisk CF Card Adapter that slid into one of my laptop's PCMCIA slots. With the adapter in place, all I had to do to transfer photos was to remove the CF card from the camera, plug it into into the CF adapter in my laptop, and copy the photo files from the CF card to my hard drive, exactly as if I were copying them from a diskette (but much faster). The adapter, by the way, cost less than $7 from Buy.com. USB CF Card Reader: I don't have a PCMCIA slot in my desktop PC, so how was I going to be able to transfer photos from my camera to my PC when I returned home? That problem was neatly solved by a SanDisk USB CF Reader (actually, it's a reader/writer) that I picked up from Buy.com for about $35. The reader plugs into my PC's USB port; as with the PCMCIA adapter, I remove the CF card from the camera, plug it into the USB reader, and transfer the photo files to my hard drive. monitor, but it's very awkward.) So I invested in eight (two sets of four) NEXCell rechargeable NiMH (nickel metal hydride) batteries from Thomas Distributing for about $2.50 each. I found that I could take about 100 photos on one set of NiMH batteries, which was a dramatic improvement over the dozen photos I could take with a set of regular alkaline AA's. Battery Charger: Since rechargeable batteries are pretty useless unless you can recharge them, I went back to the Thomas Distributing website and bought a Maha MH-C204F Rapid i-Charger, which allows you to charge and condition up to four NiMH batteries in about two hours. 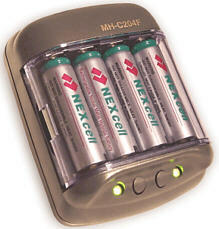 The charger came with a another set of NiMH batteries (which came in handy) and set me back about $32. And since I knew I was going to be using the charger in Europe, I shelled out another $12 and picked up a European AC adapter specifically designed to work with the charger. Telephone Adapter: Every time I travel outside the U.S., I first visit the Walkabout Travel Gear website and purchase telephone/modem adapters for the countries that I'll be visiting, for $13 each. Increasingly, I'm finding that hotels outside the U.S. (especially upscale hotels that cater to businesspeople) have RJ-11 jacks in the guest rooms, obviating the need for an adapter. However, most hotels still feature indigenous phone jacks, so you won't be able to telecommunicate from most places in the world without an adapter. Graphics Software: I used to rely on Micrografx Picture Publisher, which was easy to use (an essential criterion for me, as I have no artistic talent or background whatsoever), but which did not do an especially good job of reducing the size of graphics. Since many of the photos I took were huge, size reduction was a critical element in the creation of this website. So at the recommendation of a friend who works with Web graphics for a living, I switched to Macromedia (now Adobe) Fireworks, which is also fairly easy to use, and which does an astoundingly good job of reducing the size of large graphics without also dramatically decreasing the quality of the result. Web Editor: Finally, people occasionally ask me what Web editor I used to create this site. I do have Macromedia Dreamweaver on my development PC, and I think it's an excellent piece of software  but I started out by coding HTML by hand, and I've gotten very set in my ways, so I tend not to use Dreamweaver except in emergencies. So the answer is that this website was created not with a Web editor but with a text editor (Windows NotePad, in fact).